After grocery shopping on Friday evening Tyler informed us that he was bored and needed to see if his friend Josiah was at Parque Copa. As I walked out the door we saw Tyler going down the stairs, via outside the railing from our second floor. We informed him that we did not particularly like him going down in manner. His reply was, “It’s not that high”, and then he bailed off the top of the steps. We had to go back into the house to grab something before going to park. When we attempted to leave for the second time we walked out and noticed that Tyler was sitting on the 10-foot wall separating the other apartments in our complex. I thought to myself, I should tell him to get down, but then I thought, no he needs to climb and get it out of his system. We made it to the park and began visiting with our friends, while Tyler and Emma set out to find their friends. We were at the park less than 15 minutes and I heard Tyler screaming- the kind you when you know something is wrong. We searched to locate the origin of the screams, finally finding him at the bottom of the monkey bars. He really loves the monkey bars. His grandfather is always calling him a monkey and he loves to live up to that nickname, often times swinging like a monkey, climbing like a monkey, talking like a monkey, and hanging like a monkey. It was hanging like a monkey he chose to imitate on Friday. Apparently Tyler was hanging upside down by his knees and according to him, he raised up to grab the bars and slipped because the bars were wet from the sprinkling we had received about half an hour earlier. He slipped and dove head first into the ground. During the decent he put his hands out to break the fall and his right hand hit the ground first. The force of his fall forced his hand to bend backwards. When we finally got him calmed down he told us his leg hurt and so did his hand. According to him, he could not even stand. After some encouragement we finally got him to his feet and ruled out a broken leg. The hand, arm, wrist was our next examination. Tyler has been hurt many times before. Most of the injuries he has suffered in the past have been dramatic but not serious. This time, however, I could tell he was hurting, BAD! So we decided to get him home. Our first plan was to just ice it, but on the way home, I decided we needed to get him to see our new friends the Wilson’s. Nathan and Audrey Wilson have been such a blessing to our family. Nathan is a pediatrician, who is part of a team of five families going to Peru. The Wilson’s welcomed us into their home and Dr. Wilson began an exam of Tyler. After a complete exam, Dr. Wilson suggested that we go to the emergency room. Ironically, our insurance ended in January and we have been applying for new insurance, but it has not gone into effect yet. So here we are on a Friday night, in a foreign country, without insurance, and Tyler probably has a broken arm. One of the words we have learned is “tranquillo”, which means breath and relax. After Dr. Wilson give us his prognosis and the insurance thought hit me, I simply said, “Tranquillo”, under my breath. The Wilsons were having a house church worship service that night and extended an invitation to Emma to attend while we went to the hospital. Emma gladly accepted and we were out the door and on our way to the hospital. We walked home and got the necessary hospital items (Credit cards, passports, books, iPods, etc). While Kristi was gathering the hospital bag, I called our neighbors the Sills, who called a taxi for us. Within 5 minutes the taxi was at the door. As Tyler climbed in the driver just stared at him. My first thought is “Oh, this guys is going to think I beat my kid”. So before I even got into the taxi through a mixture of sign language and Spanish I explained that “Mi hijo……. I did not know the word for break so I made a breaking motion with my hands and then finished the sentence with…. Brazo o meneque (reinforcing with a pointed finger to my own hand and wrist). The driver did not know any English, but you could see sympathy on his face as he drove. He told us several times he was trying to get there as fast as possible. Occasionally he would reach behind the seat and pat Tyler on his leg and nod his head, as if he was saying, “It’s ok, I’m sorry. I’m hurrying. It will be ok”. The driver got us there in less than 10 minutes -considering seatbelts do not exist here, we were glad to arrive quickly and safely. A volunteer at the front door pointed us in the right direction to emergency room. When we walked through the doors Kristi Tyler and sat down while I tried to figure out how to communicate our need. When I stepped up the desk, I asked the receptionist if she spoke English. She said no, but motioned for another guy behind the admission desk. His name was Jonathan and he did speak English. He helped me get registered. We did not have all the information they requested, but they were very kind and worked us in. He said a doctor would call us when it was our turn. I sat down and reminded my self, “tranquillo”. Kristi was reading Tyler and book as he lay in her lap. I began to listen to the story trying to figure out what was going on in the book. Before I could put the story together a doctor called for Tyler. The doctor spoke very little English. He looked at Tyler’s arm and then asked where we were from. We told him Texas. He laughed and rambled off a sentence to Kristi. He had to repeat it several times, each time we picked up a new word until finally we were able to understand what he was saying. He asked Kristi if when she wore high hills in Texas, did the heel sink into the ground and oil come up. He gave us directions to radiology to get an X-ray and instructed us to bring the X-rays back to him when we were finished. We moved around the hospital and found radiology not too far from the ER. We walked up to the desk and handed the receptionist instructions from the doctor. They told us it would be a few minutes and that we needed to pay before x-ray. So I handed her the card and she ran it through. I keep trying to guess in my head what it was going to be. $250.00, $500.00, $100.00? She handed me the receipt to sign and I saw a figure of 35,000. I did the math quickly in my head. The total was going to be $700.00. NO! It is going to be $70.00 US. We were so surprised as we took our seats to wait for the radiology specialist to call Tyler’s name. Tyler had been working on reading his first book and completing a book report for call. He choose Hank the Cow dog. So while we waited we read some of his book. It took less then 10 minutes for Tyler’s name to be called. Kristi went with him while I waited. They reappeared 5 minutes later and within another 5 minutes we had the x-rays in our hand. We went back to the emergency room waiting area to see the doctor. While we waited we tried to give our amateur diagnosis. Kristi said she had seen many of her dad’s x-rays growing up and she gave the diagnosis of a broken arm, pointing to the x-ray. Within a few minutes we were back in the doctor’s office waiting to hear his professional opinion. “Is that all” He told us that if we had broken our arm it would be four weeks and his arm would take six weeks to recover. 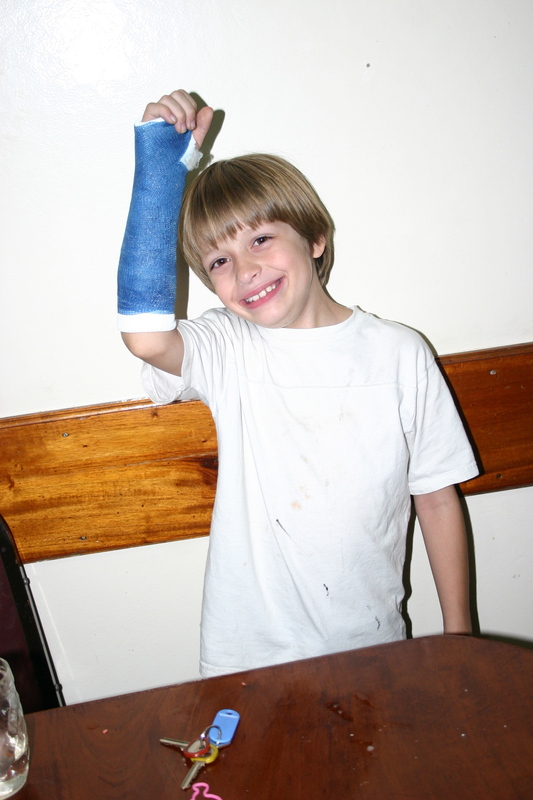 Tyler climbed up on the exam table while the doctor prepared the cast. After the doctor put the cast on Tyler’s arm he made Tyler an origami frog. We both were very impressed with the loving attention and time the doctor took with Tyler. Before we left he gave us a date of March 14th to come back to have the cast removed. We thanked the doctor and returned to the waiting room. As I got into line to pay I realize that it had taken less than an hour to register, see the doctor, get an x-ray, and set the cast. The only thing we had left to do was pay for the ER visit. The cashier handed me the bill and it equaled a whopping $70.00. Despite the fact that we did not have insurance and that we were in foreign country, we made it out of there for $150.00 including the taxi fee to and from the hospital. Tyler did a great job! He was very brave and was very strong. Neither Kristi nor I have had a broken bone, but we were both impressed with how Tyler handled himself. Hopefully this will be the last broken bone he has.